This bundle includes the first two books in Morgan Rice’s #1 best-selling fantasy series, The Sorcerer's Ring (A Quest of Heroes and A March of Kings). A Quest of Heroes, book number one in The Sorcerer's Ring, revolves around the epic coming-of-age story of one special boy, a 14-year-old from a small village on the outskirts of the Kingdom of the Ring. The youngest of four, the least favorite of his father, and hated by his brothers, Thorgrin senses he is different from the others. He dreams of becoming a great warrior, of joining the King’s men and protecting the Ring from the hordes of creatures on the other side of the Canyon. When he comes of age and is forbidden by his father to try out for the King’s Legion, he refuses to take no for an answer - he journeys out on his own, determined to force his way into the King’s Court and be taken seriously. But the King’s Court is rife with its own family dramas, power struggles, ambitions, jealousy, violence, and betrayal. King MacGil must choose an heir from amongst his children, and the ancient Dynasty Sword, the source of all their power, still sits untouched, waiting for the chosen one to arrive. Thorgrin arrives as an outsider and battles to be accepted and join the King’s Legion. Thorgrin comes to learn he has mysterious powers he does not understand - that he has a special gift, and a special destiny. Against all odds, he falls in love with the king’s daughter, and as their forbidden relationship blossoms, he discovers he has powerful rivals. As he struggles to make sense of his powers, the king’s sorcerer takes him under his wing and tells him of a mother he never knew, in a land far away - beyond the Canyon, beyond even the land of the Dragons. Before Thorgrin can venture out and become the warrior he yearns to be, he must complete his training. But this may be cut short, as he finds himself propelled into the center of royal plots and counterplots, ones that may threaten his love and bring him down, and the entire kingdom with him. This was a great read! I'm rather picky about the books read I like to check out the reviews first you get an idea of what I'm looking at. Most of the reviews on this were really good except for a couple that says it was repetitive and not a good read I found it to be the opposite. The book were entertaining, captivating and well written with great narration. Highly recommend and I'm looking forward to reading the other 15 books in the series. The story is very engaging ,with interesting characters & a very believable world. The main character Thor is a little prideful, very naive & too corny at times. However, he is a likable character that you want to see succeed. His corny behavior stems from his being overly grateful for any little compliment, attention or assistance and his self deprecating manner. There were more than a few contradictions in the story such as, after the brothers man friend stabbed his father , the eldest legitimate prince saw that his door was opened & ran to shut it, making sure a beam was locked in place on the door. They heard a loud knock on the door & guards burst through the door.... This was not a breaking down of the door, but a pushing open of the door. How can that be when it was barred shut by a beam like device?? There were several obvious contradictions like this. However, the book was so good, I really did not care too much about these small inconsistencies. I’m looking forward to reading the rest of this series, to see the unfolding of Thor’s magic , his true lineage, and the man he will become. 5 stars for this book bundle. I saw a bunch of reviews talking about how amazing this series was so I wanted to give people my perspective. I know people like different writing styles, and that some people will like this book, but I kind of wish I was warned at least a bit. I love epic fantasy, and this book fell very short for me. This series leaves you on the edge of your seat constantly in a very bad way. Half the chapters are left with cliffhangers and then you are taken to another point of view. The resolutions, if they actually come are lacking as well. The characters are fairly simple. They are either really good, or really evil. The good guys are easily tricked or mislead. That misunderstanding troupe is used liberally. If anybody hears anything from an obviously evil person they will for some reason believe it. They will never have a real conversation to the person that is slandered instead they will just say the other person's name instead of trying to explain. These parts made me want to tear my hair out. The people in the world do not act like normal people. The storyline is straight all the way through. The boy wants to become a warrior and goes through warrior training. He finds out that he has a very great talent in magic, but instead of trying to figure that out he just does warrior training. By warrior training I mean talking about how good friends they all have become and some saving the other characters via dues ex machina. Also they talk constantly about how hard training is. The world to me just did not make sense. Part of it was because when they find someone that is obviously a sorcerer and that he needs to be protected they do the opposite. Conversations where they discuss the main character or talk to him have no effect on what he does or what they do about him. The magic is unexplained at least through the three books I have read, but is constantly used to get out of any sticky situations or to foretell something. The amount of times the main character felt a fire inside him like he never knew he could feel was way to often. Certain phrases were used so often that they made the characters look like idiots. The amount of things the characters can hardly believe was infinite. Expect no conclusion after a book, but only another cliffhanger that will probably not be resolved for a few more books. In the end these books gave me the feel of a filler episode on TV. I have never read so many words with so little substance and I read my own review........ Anyways I just can't recommend this series. It is very troupe filled, with things as love at first sight, mysterious old mentor who speaks in riddles, pets the character receives that save his life constantly, lots of whining, and dumb misunderstandings. This is a fantasy adventure epic must hear. There's nothing like listening to an excellent epic. 5 Star Recommendation. it was ok, but by the end of the first book, when i thought the character should finally start taking control of his own destiny, nothing happened and the book ended on a cliffhanger. no problem, book 2 starts, and the MC goes right back to a helpless passenger on the way to destiny. What was most disappointing about Morgan Rice’s story? Morgan does not write believable male characters, and the main character just moves through the world and things happen to him. he really doesn't have that much agency. What about Wayne Farrell’s performance did you like? he is enjoyable to listen to, his voices for characters are consistent and recognizable. 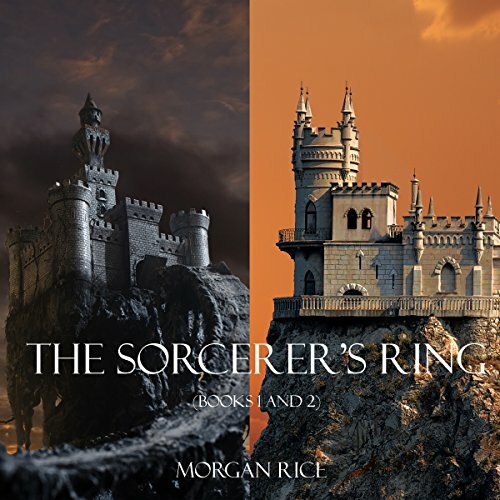 Could you see Sorcerer's Ring Bundle being made into a movie or a TV series? Who should the stars be? overall the story isn't bad, but the only characters that are fleshed out are the king, and Gareth. The rest are just cardboard cutouts meant as set pieces for the grand campaign the author wanted to write.